Download WhatsApp Plus Reborn v1.80, WhatsApp+ Apk By OsmDroid - It did not take long for the update into the latest version. 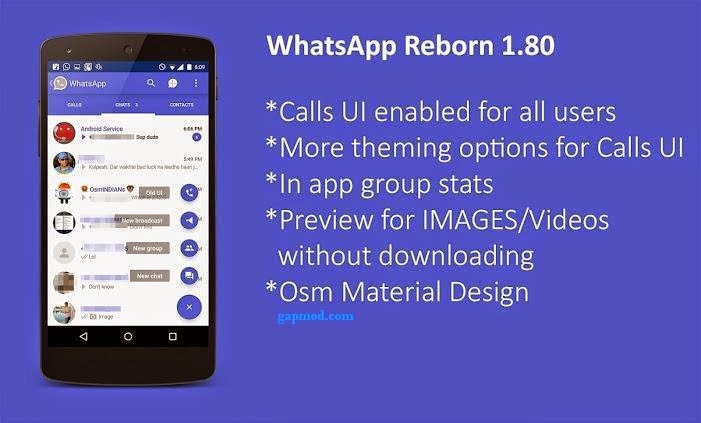 WhatsApp+ Plus Reborn has now reached version v1.80, with a new features that must have been awaited by users WhatsApp+. Some features may look new, (Calls UI Enabled) especially for those of you who have not used this application. For who has never used WhatsApp Plus, the possibility of the installation will fail, but you do not have to worry, I will provide a simple way to install this application. Immediate download WhatsApp Plus Reborn in gapmod.com, because the link is easy to download. For how to install simple: Open the official Whatsapp & Go to Settings → Settings → Backup Chat Conversations. Uninstall Whatsapp, and then Install Given WhatsApp+ Reborn's apk.